So, what is plaster actually made of? Continue reading So, what is plaster actually made of? First off, kudos for having the courage to tackle this ceiling plaster repair job yourself, Janine. 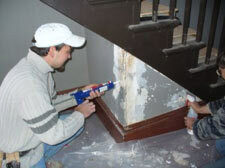 We love to see homeowners doing repairs the right way and making the effort to preserve historic plaster. Just like an old car, your home requires maintenance. The insertion of small amounts of capital into a building over an extended time period can mean the difference between a beautiful, functional house and a falling-apart, expensive headache of a house. We Could Have Saved This One! We recently saw a television commercial that made us laugh, then nod our heads in agreement, then cry (Okay, we didn’t actually cry. But the seriousness of the commercial’s message was well received). The ad was for a carpet cleaning service. Two cleaning techs are driving down the road in a company van when they see a worn-looking rug rolled up and tossed out on the side of the road for trash pickup. The driver of the van slams on the brakes, dashes out of the van and kneels beside the rug. “No!” he cries. “I could have saved this one.” He glances up at the offending house… “I could have saved this one!” Continue reading We Could Have Saved This One! There are lots of tools, processes and materials specific to plaster and plaster repair. Some of their names you may recognize, some may sound vaguely familiar, and some may be completely foreign. Lead Paint May Be Lurking on your Walls. Now What? If your home was built before 1978, the EPA (Environmental Protection Agency) says it may contain lead-based paint. You’ve most likely heard about the dangers this presents to your family and pets, and we often are asked how to deal with plaster walls and ceilings that may contain lead paint. Continue reading Lead Paint May Be Lurking on your Walls. Now What? This post is part 1 of a 3-part series. This post is part 2 of a 3-post series. This post is part 3 of a 3-post series. The video below is part 2 of a 3-part video series. You can also watch Part 1: Stabilizing Lath and Plaster and Part 3: The Finish Coat. Do you still need building permits if you’re repairing cracked plaster walls or ceilings? As long as you’re not doing any structural renovation, the answer is generally no, you do not building permits. Just ask Mike, a Plaster Magic® customer. We call this inferior method of plaster repair the “Scrape and Tape.” It is commonly deployed on a crack in a plaster wall or ceiling. The repairman uses a metal scraping tool, such as a paint scraper, to gouge a groove directly over the crack. 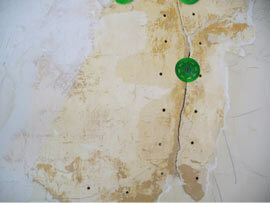 He will then typically use drywall screws to secure the plaster around the crack to the lath. He then uses joint compound to fill in the groove, either with or without drywall tape or mesh, just as he would treat a seam on installed drywall. First, some background. The RRP Rule is the Renovation, Repair and Painting Rule. It was issued by the Environmental Protection Agency in 2008 to help protect against the hazards of lead-based paint.